Terengganu, a state on the east coast of Peninsular Malaysia, might be well known for its many beautiful islands. Indeed, many people head there for the islands. Perhentian Island, for example, was once voted 13th best beach in the world by CNN. Lonely Planet also voted the island as the 5th best beach to swing a hammock in. Redang Island, on the other hand, has one of the best marine parks in the region. And the beach? I can assure you it’s not bad either! What's more, the marine park in Redang is not just great for snorkelling & scuba diving, but also for jungle trekking. Perhentian and Redang nevertheless are not the only islands in Terengganu. There's Lang Tengah Island if you want a more private holiday. And then, there are Kapas & Gemia Islands, the nearest to mainland Terengganu and popular for their natural beauty & squid jigging! And of course, there's Tenggol Island, a heaven for scuba divers wanting to get up close with migratory whale sharks. So each island of this beautiful state of Terengganu has its own appeal & attractions, you are forgiven if you have a hard time to decide which one to visit! But whilst trying to decide, let’s not forget and skip Kuala Terengganu, the state capital, in our haste to head to the paradise island of our choice. Most would say that Kuala Terengganu is a small sleepy town (although it is actually a city) and most could be right. Kuala Terengganu is not Kuala Lumpur or Penang or even Melaka. There really is no point in making any comparison as each destination is unique. But it doesn’t mean that the town (or rather, the city) of Kuala Terengganu doesn’t have anything to offer to visitors in terms of attractions, whether it’s from cultural perspective, history, activities or just scenery. Apart from the legend, Bukit Puteri is home to the ruins of a 19th-century fort that also offers a great view of the town, Terengganu River and Duyong Island, home to the traditional boat-making industry. Just next to the hill is Istana Maziah (Maziah Palace), the state’s royal palace that is used for official royal ceremonies. It's not opened to the public but you can still see the palace from the perimeters of its compound. The town’s central market, known as Pasar Payang (Payang Market), is both a wet and dry market, and is a must visit even if you’re not looking for anything. 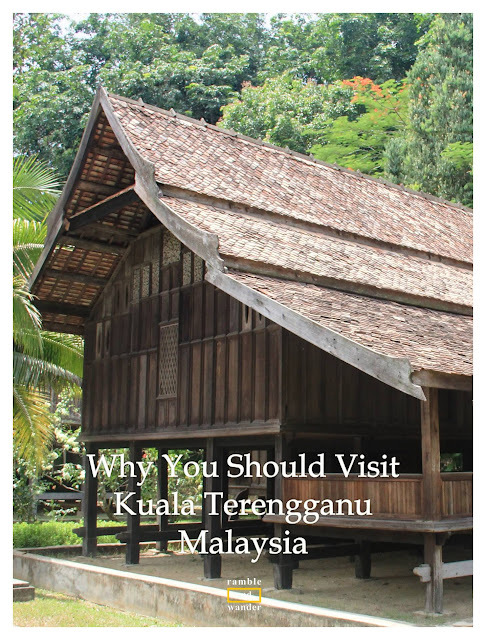 If you’re looking for something, however, it’s a good place for some cheap souvenirs, local foods, fruits and snacks, colourful batik and to the more intricate and expensive woven songket and maybe some brass works that Terengganu is so popular for. Next door to Pasar Payang is Kampung Cina, the town’s small yet thriving Chinatown, which has been spruced up and turned into one of the main attractions in town owing to its history and unique Peranakan culture. Street arts dotted its many lanes, each with a different theme making it a nice exploration while you walk along the historic and traditionally designed shophouses. Be sure not to miss Turtle Alley while you’re there! You’d probably need at least half a day to cover Bukit Puteri, Pasar Payang and Kampung Cina. More if you’d like to shop for some souvenirs at Pasar Payang or stop for some coffees at one of the many growing-in-numbers hipster cafés in Chinatown. The Museum, the Park and the Crystal Mosque. And the River Cruise. Away from the town, just some 5 kilometres from it and accessible by local bus and taxi service, is Terengganu Museum, located in Kampung Losong that is also popular for their keropok lekor, a local snack usually dubbed as fish sausage. Now not many know this but the museum is the largest in South East Asia and houses plenty of exhibits in a number of huge buildings that resemble the state’s traditional houses. Along with some actual traditional houses in its compound by the river, you’d probably need 2 to 3 hours, at least, to explore the place. Whilst the park has an entrance fee, the nearby Masjid Kristal (Crystal Mosque) doesn’t. Built using steel, glass & crystal, this mosque has become a major landmark in the state of Terengganu and it is easy to see why. Once you’re done at the mosque, you can easily hop on a boat for a river cruise along Terengganu River, checking out the mangrove areas, small fishing villages and also the traditional boat-making industry in Pulau Duyong (Duyong Island) along the way. The trip to the museum, the park, the mosque and the river cruise can already easily take between half a day to one whole day. So in total, that’s already a day-and-a-half quick itinerary for Kuala Terengganu whilst on the way to your island paradise. If you have more days to spare, however, head over to Tasik Kenyir (Lake Kenyir), the largest man-made lake in South East Asia. Long has been a haven for anglers, the lake – despite its man-made status – is now actively being developed by the state as an eco-tourism destination. Do not underestimate the size of the lake, it's about three times the size of Singapore. Here you can go on an island hopping trip, with each island being developed with its own unique attractions and activities. There are Orchid and Tropical Parks to visit, jungle trekking to kelah (Malayan mahseer) sanctuary, waterfalls and caves, a day might not be enough if you’re really into eco-tourism. Water sports like kayaking and rafting can be found here too. If you’d like to stay in the area, worry not, there are plenty of resorts and boathouses too for you to choose from. There is now also a water theme park in Lake Kenyir, as well as an elephant conservation centre called Kenyir Elephant Village not far from the lake. You’d need to allocate at least a day if you’d like to explore Lake Kenyir. 2 days and 1 night would probably be more ideal. To find out more about what you can do in Lake Kenyir, read this blog post - Malaysia: Lake Kenyir, Terengganu. Have more days to spend and would like to try something different? Go squid jigging! Squid jigging, or ‘mencandat sotong’, is the traditional way to catch squids that is popular among the locals. If you’re travelling in a group, especially between the months of April and August (which is the season for squid jigging), you can rent a traditional wooden boat and its crew for an evening or overnight trip to the open sea and learn how to catch squids from the experts themselves. Watching the sun sets and spotting the stars in the night sky are the added bonus on this kind of trips. Having been on four squid jigging trips, I can assure you it’s a very unique and memorable experience and can be very fun especially among friends. You can read about my experience and watch a video of me squid jigging here. Tips: Your hotel can usually make the arrangement for the boat but you can also contact Pak Mat, a local fisherman/boat owner at +60199842641 to rent his boat & crew. Have you been to Kuala Terengganu before? How did you find it? If you haven't, would you consider it for your holiday in the future? Looking for someplace to eat whilst in Kuala Terengganu? You can find some great food recommendations by a local travel blogger here. For other blog series on "Top Things to Do and See in...", click here. Terima kasih. Kalau ke sana, boleh cuba berbasikal dari bandar ke Kampung Losong (Muzium) dan Pulau Wan Man (Masjid Kristal). Kalau rasa lagi adventurous, boleh kayuh sampai Kenyir, haha! I must come to Terengganu again! I love the museum and of course, ikan celup tepung + keropok lekor. ya, memang saya ingat makanan je kalau pergi KT. hehe.. The museum is one of my favourites too! And yes, all the food... yumyumyumyum! It all looks wonderful. We visited Kuantan earlier this year and are so glad we were able to experience the beauty of the east Peninsula. We love Malaysia. Thanks. I think it's wonderful that you visited Kuantan. Many usually skip the city and head direct to Cherating. I love Cherating and would totally recommend it too but I'm sure Kuantan has something to offer as well. Looks like an intriguing place! Im sorry I missed it when I was in malaysia earlier this year. Looks like a place well worth visiting! Definitely! I know I might be biased (as I'm originally from the city, haha! ), but it's something different from other popular destinations in Malaysia. Wow, so much to see and do there. It really seems like a hidden gem. The most famous places are not always the best to visit! I would say the islands in Terengganu are quite well known but the state capital itself is not. But yes, many don't really know about what to see and do over there. As someone who originally hails from there, I prefer it that way (less touristy, etc.) but at the same time, I feel it such a shame if people flocks to one of the many islands but fail to explore the city as well. Malaysia is so beautiful! The architecture, the people, the beaches are all reasons to go. I love your photos and I can't wait to go and snap my own! Great post on a great destination! Thank you, Mia! Do buzz me if you're in town. What a great post and stunning photos! We are heading to Malaysia on November, but to the other side in the Andaman Sea. Maybe we should stay longer and cross the peninsula... Kuala Terengganu looks a paradise worth the visit. Cheers for sharing your great moments. It looks wonderful. I don't know much about Malaysia, but I really liked this article. Thank you for learning me about new, appealing places. Wow, the crystal mosque is unlike anything I've ever seen! Funny that they don't get as much tourist attention as neighboring islands!! I would love to plan a visit here - I actually really like spending time discovering "sleepy towns" because they're generally less crowds and it's here where you gett an authentic travel experience. Thanks! Yes, hailing originally from there, I'm a bit torn writing about the place. On one hand, I prefer it not to be crowded with tourists but on the other hand, I find it a shame that many skip it to head direct to the islands. By the way, architecture-wise, there's also another mosque that's kind of unique in Kuala Terengganu. It's called Floating Mosque. Great for a photo opp! There seem to be so many things to do, and so many islands in Malaysia. Kuala Terengganu looks interesting and seem to have a lot of things that I will enjoy doing. One day I will get to Malaysia! Yup, there sure are plenty of islands in Malaysia with each one having its own plus points. Kuala Terengganu is more laid back compared to other bigger and more popular cities in Malaysia but I think that's an attraction in itself. Yup, I believe so too, having to compete with cheaper destinations in the region but somehow the country is 13th most visited in the world in 2013 or 2014, I can't remember. I was born and raised in Kuala Terengganu but now reside in selangor/KL for educational/working purposes... and I really love reading post about what others think/love about my hometown. I agree that having a local friend there would help a lot, and I think it works that way at most destinations too.